Yomibots team members present their invention, the Greymobile, a bike that delivers recycled water to lawns. 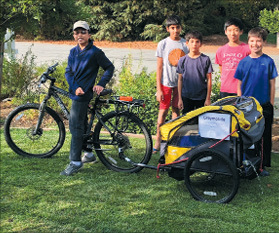 Pictured are, from left, Chase Omura, Nikash Gupta, Alex Zaretzki, Gabriel Ancajas and Sean Herby. Water is a big part of our life; we use 80-100 gallons per day. Think of it as 28,800-36,000 gallons per year. Bottom line is, we use a lot of water. Not to mention that we have had way below average rainfall at the end of 2017 and in the beginning of 2018. Conserving this precious resource is paramount. Luckily, the Yomibots – a FIRST (For Inspiration and Recognition of Science and Technology) Lego League robotics team – has been working on ways to save it by using greywater. What is greywater? Greywater is partially contaminated water, in between clean water and blackwater. Blackwater is completely contaminated water that should not be reused for anything, usually coming from the toilet. Clean water is from your tap or refrigerator that can be used for drinking and anything else. Greywater is still contaminated, not good enough for drinking but still usable for watering trees, plants and lawns. It can usually be obtained from washing machines and bathtubs (depending on the type of soap or detergent used). Greywater systems can be installed to redirect your water into your lawn or plants. I spoke with Margaret Suozzo, co-founder of GreenTown Los Altos, and she said the reason this is an effective savings is that 50-75 percent of the water we use, which comes from the Sierra Nevada range, is just dumped straight onto our lawns. So now you may be wondering what we plan on doing with greywater as a team. Well, Chase, a member of the Yomibots, has an elderly neighbor named Marilyn who is in her 90s. She lives by herself, so she doesn’t produce as much greywater as Chase’s family of four. To help Marilyn, Chase and the rest of our team invented the Greymobile – greywater on wheels. This invention enables Chase to transport his family’s greywater to Marilyn’s lawn. How does the Greymobile work? Basically, it is a bike with a large compartment with wheels that has a cooler inside. The cooler stores the greywater, which would come from a washing machine or bathtub, and has a nozzle to dispense it onto a lawn area. All Chase needs to do is ride the Greymobile over to Marilyn’s lawn, take the cover off the nozzle and ride it around her lawn while it dispenses the water. The Greymobile is a fun, fast and easy way to water your and your neighbor’s lawns. We may think that water is a small part of our life, but in reality it’s bigger than you could ever imagine. That is why we need to find innovative ways – like the Greymobile – to conserve this valuable resource. So “water” you going to do to save water?